Yesterday, I posted about RV integration in Windows Explorer. Today, I have the script and a tutorial on how to hook this up ready for your pleasures. Just download the script, place it somewhere safe and follow the tutorial on how to create an RV specific right-click menu entry in Windows Explorer. That is right folks, duber.tv, a free VFX videotutorials resource, will be permanently shut-down by July 2011. This is tough news for me as it is, I believe, for some of you. I’ve given this a long and thorough thought and I came up to this conclusion. duber.tv simply doesn’t make any money and thus doesn’t make any sense for me to keep running. You might not realize, but keeping a server full of lenghty and rather large free videos is an expensive business and since it’s extremely tough to survive in this business, I’ve decided to shut it down and dedicate the resources to a different venture that I’m about to pursue in 2011. 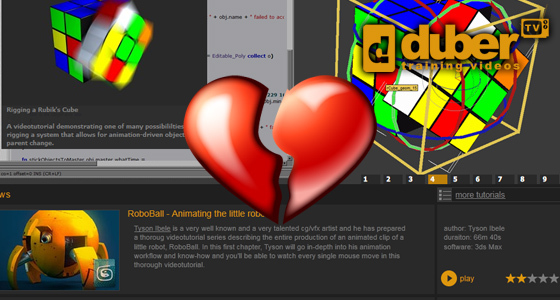 I’m sorry to all of you who loved duber.tv and I hope that at least a tiny plaster might be the fact that I’ll still keep on publishing free lectures and tutorials now and then here on this very place, blog.duber.cz. Also, I’ll close down the training DVDs shop on my main web-site very soon. So, if you want to make a purchase, do so quickly as I’ll be removing the DVDs from my site for good. They’ve served very well to, both, you guys and me, but I have to keep my focus on more important ventures, which is my core business, VFX post-production and 3D animation. Thanks for all your support and understanding. You’ve been awesome! RSMB – Avoiding rendering black frames. RSMB is a fantastic plugin that I use very often to speed up my renderings, however, there is one little glitch that almost made me go crazy! Hopefully I’ll be able to save you some time by explaining this issue and offering a fix in the video above. We’ve worked hard to bring you the best quality training in the field of computer graphics and visual effects and the final result is duber.tv. Head over to this site to get the best videotutorials all for FREE in a copact, easy-to-navigate, user interface, that’ll get regularly updated and grow with popular topics from various contributors from around the world! I hope you’ll enjoy our stuff and come back often.